Matrices for Engineers is designed to supply engineers and engineering students with a foundation in matrix theory and versatility in the manipulation of matrices. The book's approach provides the necessary material in a direct manner, with examples that illustrate each concept as it appears. The book emphasizes methodology and includes topics such as how to obtain the characteristic polynomial of a matrix; the factorizations of a coefficient matrix for ease of computation; and linear transformations from an intuitive and engineering point of view, in which conditions at one point in a system induce conditions at another. Indeed, it covers computational techniques and goes beyond matrix algebra to include matrix calculus. Introduction to Electrical Engineering (0-19-513604-7) by Mulukutla S. Sarma. It can also be used to help in preparing for the Fundamentals of Engineering (FE)/Engineer-in-Training (EIT) exam and the Professional Engineer (PE) exam. 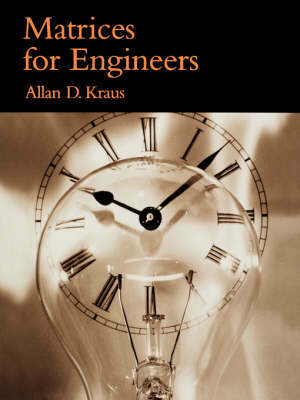 For a complete and detailed list of engineering exam review books available from Oxford University Press, visit our website at http: //www.engineeringpress.com.